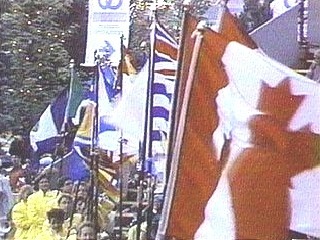 It was one of the sunniest summers in Vancouver's history, but it rained buckets the one day the news media from across Canada flocked to Vancouver to cover the festivities. Does it rain in Vancouver this much??? Nah. 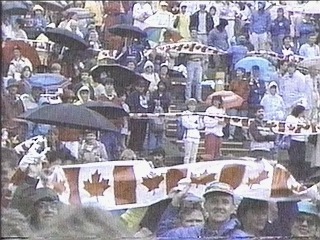 But the rain didn't dampen the spirit. The day long celebration was filled with non-stop entertainment. The festivities started with a parade. After, two runners with umbrellas in hand unferled a long (waterproof) banner that crisscrossed the entire Expo site ( I think it was to hold the Guiness world's record as the longest banner, but I could be mistaken). 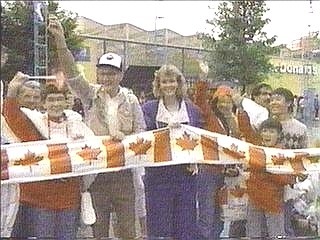 People were asked to hold on to the banner as a symbol of Canadian unity. 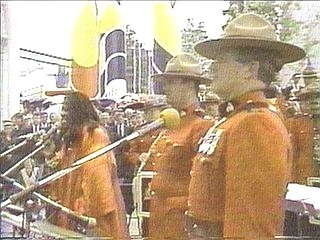 The Plaza of Nations hosted a patriotic show complete with red-jacketed Mounties and a showcase of uniquely Canadian acts. In the evening, the nightly firework display was doubled in length.